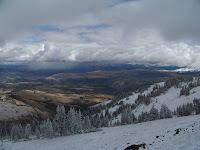 This is the log of my western vacation in September 2010. Some of my own photographs are included and some from Wikipedia. One day of traveling to go, and that's it for vacation 2010. We got up at 6:00 and hit the road by 7:30. Dad drove us to Tower Junction and up the Lamar Valley to the Northeast Entrance. 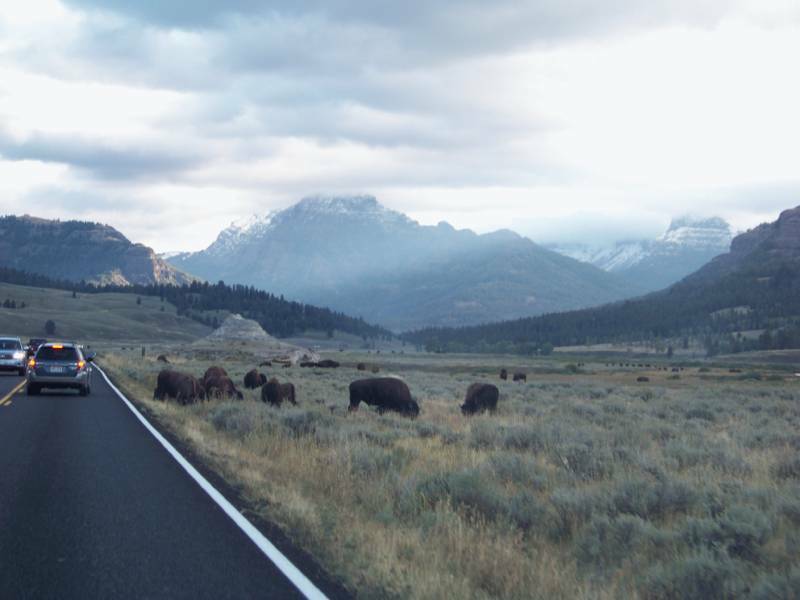 We heard rumors of a wolf pack (but saw none) and stopped for all those bison on the highway. We spotted some mountain goats on a cliff above the road before the entrance, too. The highway leaving the park here is very rugged, passing through the Absarokas Range. There were large, snow covered peaks on each side of the road. The geology in the areas of the West like this comes right to the surface- we saw a large shelf on the south side of the highway that ran on an even level on the side of the mountains for miles. We stopped in Cooke City for some gas and food. I bought an egg and ham sandwich which the clerk warned me might be several weeks old. No lie. 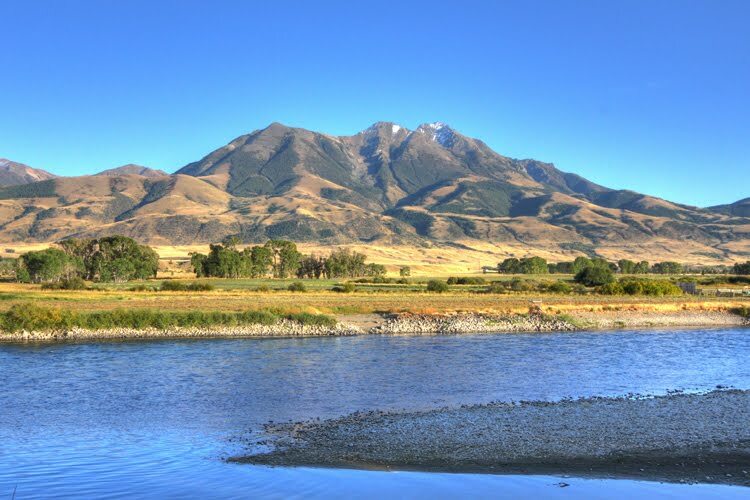 From there, we crossed into the Clark Fork of the Yellowstone Valley, a wide ranch canyon with snow covered peaks on either side. This is part of the Chief Joseph scenic highway. This is all cattle range. Near the top of the valley, the Absarokas came together into a rough, stony gorge and then we switched our way back over Dead Indian Pass. There's great views of the canyon and the Absarokas from here. Once at the top, the view goes the other way (to the east), and you can see plains and desert forever. This is the Bighorn Basin, another sage brush badland like we saw south of Jackson. The foothills on the eastern side are a desert badlands with red, rocky buttes and formations. It levels out pretty quickly though, and was much flatter by the time we made Cody around 10:30am. We rolled through the lower badlands and into Thermopolis, where we ate lunch at the at the world's most Western restaurant. I took over the driving from here. We could still see the Absarokas to the west, and the Bighorns a great distance to the east. 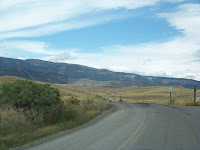 There were many hills and buttes in this area, and the road went quickly into the Wind River canyon of the Clark Fork River. This is a deep, narrow canyon with rocky walls. I understand that there was a rock slide and train crash here a few years ago- you can see some videos of that on the internet. We didn't have any such trouble except for a construction zone at the mouth. Once we left the canyon, we were out of the badlands. From here the road was flat, straight and desert. I started measuring the longest straight stretches, and in this section I hit 5.1 miles without turning the wheel. There are slow rolling hills in this section, some grass, and pronghorn antelope everywhere. We sped through a few little towns, including some on the Indian Reservations with their obligatory casinos. At Casper, we picked up I-25 and then really started to make time (as if we were going slow before). The highway follows the North Platte River here, which is probably the most green part of central Wyoming that we saw. We had to stop briefly for a flat tire outside of Casper. Danny had a full size spare though, which kept it from being a real problem. The rest of the ride through Central Wyoming is just flat prairie. Near Glendo we could see the Laramie Mountains and Laramie Peak in the distance to the west. There are some badlands closer to the river, and in one stretch we saw lovely bluffs over the N. Platte. Away from the river, nothing but grassland and straight stretches. I hit a 7.0 mile straight stretch in here. It's flat as a board closer to Cheyenne, stretching to the horizon in the east. All the way to Ohio, probably. Here though, some hills appear in the west, and the Colorado Rockies are finally visible to the Southwest. Traffic really picks up once you take I-25 into Colorado, and Danny was driving in this section, for which I'm glad. About ten miles into Colorado we could see large mountains directly to the west, and there were two very prominent peaks to the west at the I-25 exit for Rocky Mountain National Park. Long's Peak perhaps? And that was it. We made it back to Dan's apartment around 7:30 and got some pizza for dinner. We watched some football, and relaxed from a grueling 12 hour drive. I got to sleep on a couch, then Dad and I were off first thing in the morning from Denver to Philadelphia, and back into Pittsburgh by 7:00pm. Since this was our last day in Yellowstone, I visited the gift shop first thing in the morning for some souvenirs and presents. Danny wanted to get up early and do a mountain hike, so as soon as he was up we left. 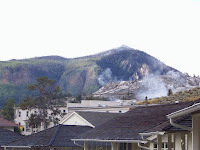 The weather had turned cooler, and there was quite a bit of snow visible on Bunsen Peak from Mammoth. We picked Mt. Washburn, which we got to through Norris and Canyon. We stopped at Canyon Village for a few supplies, then went over Dunraven Pass to Chittenden Road to the Mount Washburn trailhead. The big hubbub in the parking area was a grizzly sighting at the bottom of Chittenden Road. We stuck around the cars for a while to see if it was coming up our way, but after thirty minutes decided to move out. 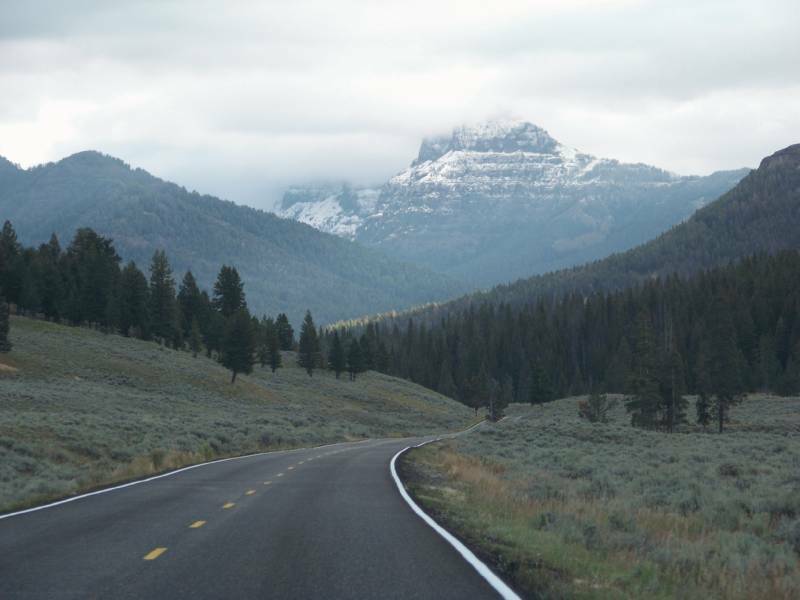 The Mount Washburn trail is wide enough for a car, and gradual enough for a novice hiker. The trail is about 3 miles from here to the ranger station at the top. We saw a few spruce grouse on the way up, and near the very top a very un-shy coyote. We had quite a bit of snow on the way up (maybe an inch or more), some sleet and a steep wind near the top. Snow squalls were obscuring the valleys to the west on the way up, and kept visibility very low on the top. 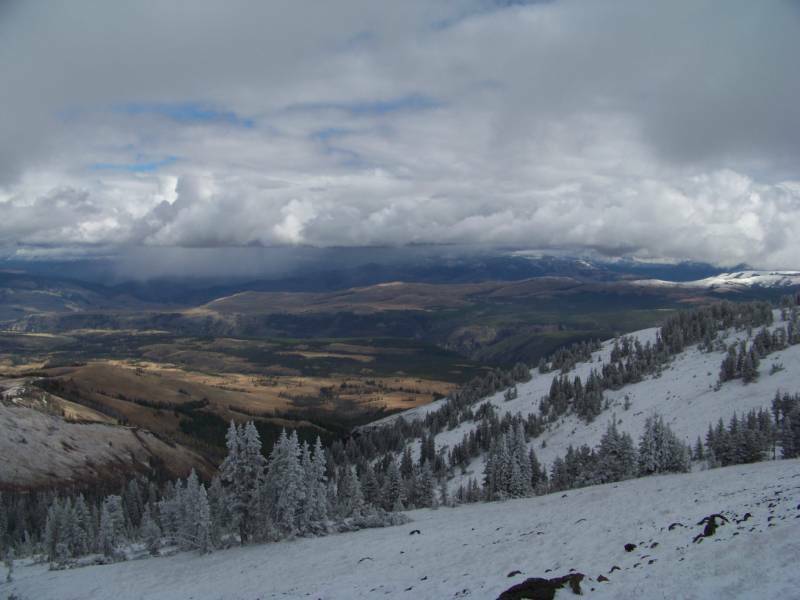 We could tell though that the snow storm was limited to the peaks we were on, and that there was some measure of sunshine in the lowlands near the rivers. There's an observation cabin at the top, in which a ranger lives part of the year to watch for fires. He was home when we arrived, but didn't spend any time with us. We ate our lunchs and watched the snow blow around. For all the squalling, we could have been on Everest. Couldn't see much. We went down the same way, much faster. We finally saw the grizzly we had heard about, as it crossed the highway thousands of feet below. Of course, we saw the traffic jam first, and then Dad was lucky enough to see the bear step out of the woods and across the road. We made it back to the car around 2:30, then Dad and I gathered up the fishing gear for our last attempt at catching the big one (or anything at all, actually). We stopped at Park's Fly Shop in Gardiner to get some gear (and tips), and then fished on the Lower Gardner below Chinaman's Garden where we had fished previously. This section of the river is VERY fast and steep and hard to work. There were few pools to fish, but the man at the fly shop thought we might have better success in a less-frequented stretch of river. I suppose that was true, as I caught two fingerling rainbows on Wooly Hare's Ear nymphs we got at the shop (about a size 10 monster). Dad didn't catch anything, but did get a couple of small strikes. I saw four antelope come down to the water and ford it. They hardly slowed down in water I could not have walked through. Then about six, Dad and I left for the Lamar Valley to do some animal watching. We wanted to go back to Hayden but didn't have time. We watched the wolf den we saw earlier in the week with a group of people, and saw two pups through the scope. And we saw bison; hundreds of bison. They're all over the Lamar Valley, more so than any other part of the park. Dad and I tried fishing early again, this time on the Upper Gardner River, near the confluence of Indian Creek. Absolutely nothing would bite. There were no signs of fish anywhere. The water was cold and flowing hard, although we were able to find some nice still pools in this section, unlike the China Garden section we fished earlier. There was a thick fog in the highlands early in the morning, but the sun burned it off around 10:00 to reveal the peaks easily visible from this area. A single bison crossed the creek near us early in the morning, but we saw no other wildlife. Once back at the cabin, we decided that today was the day we wanted to see Montana. The weather forecast showed some rain coming, so we all packed in the Liberty to head north. Dad drove us north on 89 to Livingston, through Paradise Valley. That valley is edged by the snow-covered Absarokas on the east and the Gallatins on the west. We had good sunshine for this portion of the ride. We ate in Livingston, then turned west on I-90 towards Bozeman and Butte. 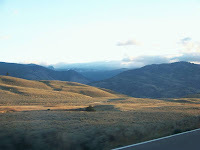 We passed through the Bozeman and Three Forks valleys, which is some of the most sublime country we saw on the trip. Three Forks is the confluence of the Gallatin, Madison and Jefferson Rivers, which form the Missouri River- Lewis and Clark country. The mountains are tall but far apart, with lovely level valleys and rivers in the middle. 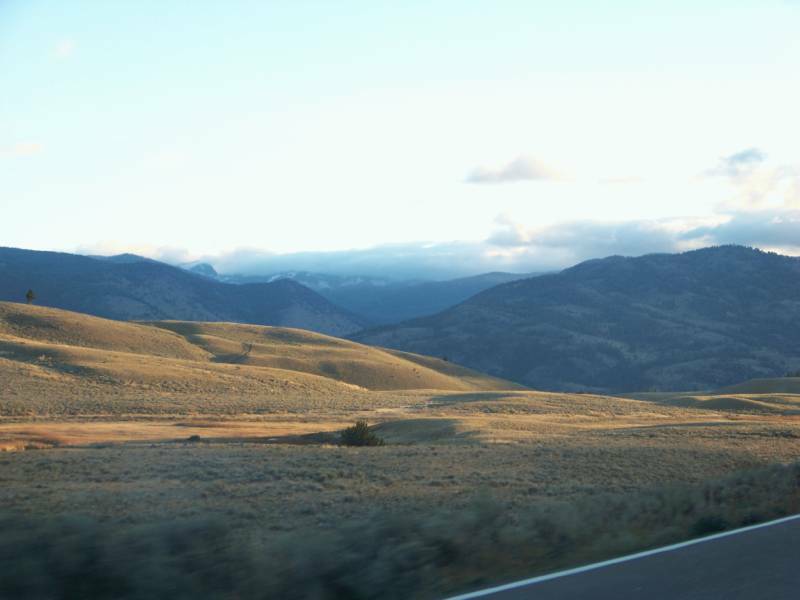 There's a small mountain range west of Three Forks and east of the Continental Divide, which is above Butte, with plains in between the ranges. It was in those plains that we hit the rain for the first time. 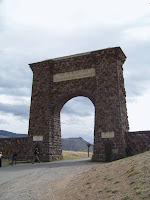 It rained hard for most of the rest of the day, probably back in Yellowstone as well. The weather wasn't much of a problem as we crossed the Divide though, a pass which is only at 6300'. The fog kind of ruined the scenery though. We saw strange rock formations all over the hills leading up to the pass, a feature that I remembered from my first trip here. We got off I-90 in Butte, and stopped at the Visitor Center. From there, we saw the Berkeley Pit Mine, an abandoned copper mine 1800' deep which is now filled with 1000' of water (and filling). Then we saw the World Museum of Mining on the other side of town (past Montana Tech). They have an interesting mineral room, equipment exhibits, and a unique multi-instrument player piano. We skipped most of the exhibits as they were outdoors, in the rain. Dad told us some interesting facts about the equipment we were able to see. I drove us home on the same route we took out. We stopped at Buffalo Wild Wings in Bozeman, where we got to see the first quarter of the first NFL game of the season - the New Orleans Saints and the Minnesota Vikings. It wasn't much of a game. The restaurant and town were pretty nice though. The rest of the trip was in the dark, in a tapering rain. We listened to Danny's Bill Cosby CDs, which were pretty funny.